No endurance. 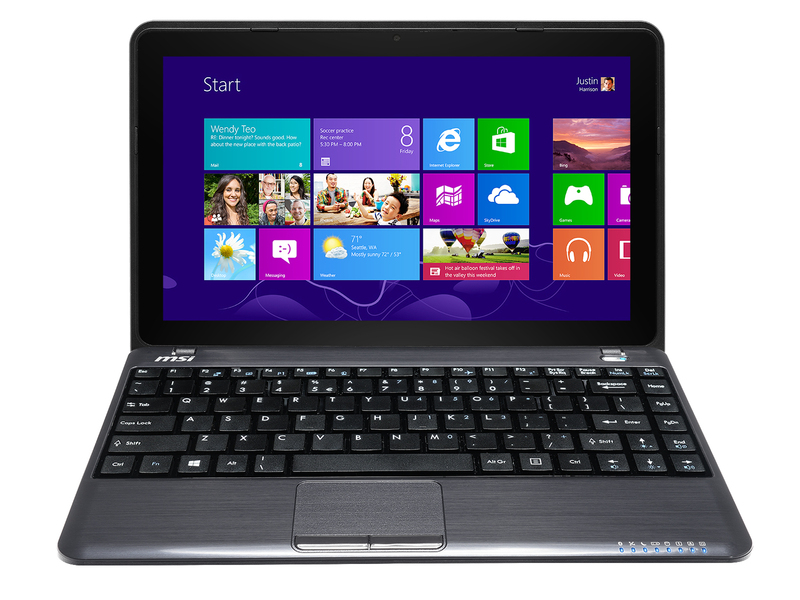 The highlights of the small 11.6-inch laptop are the mSATA solid state drive and empty hard-drive slot. Our report reveals whether the subnotebook has more than that to offer. 11.6-inch laptops are not only suitable as portable typewriters. They are also frequently used as small browsing stations on the couch at home. MSI enriches the offer of corresponding devices with its S12T. The company wants to score with a solid state drive and an empty 2.5-inch hard-drive slot. Will it succeed? All 11.6-inch laptops are basically rivals of the S12T. Examples would be Acer's Aspire V3-111P and Lenovo's ThinkPad Edge E145. The small laptop is shipped in a black plastic casing, and only the lid's back is made of brushed aluminum. Brushed aluminum is simulated on the base unit's upper side. The spaces between the keys are comprised of glossy plastic. The device proved to have a good overall build, but the base unit is easy to twist. The laptop laudably has a maintenance cover, and thus accessing the working memory and solid state drive is no problem. Furthermore, the laptop has an empty hard-drive slot. Consequently, the device could be upgraded with a 2.5-inch hard drive. MSI has managed to install quite a few interfaces despite the tight space. Even a nowadays increasingly rarer VGA-out is among them. The interfaces are distributed over the entire length of both sides, and thus the areas beside the wrist rest will not remain free of cables. Opened maintenance cover of the S12T. 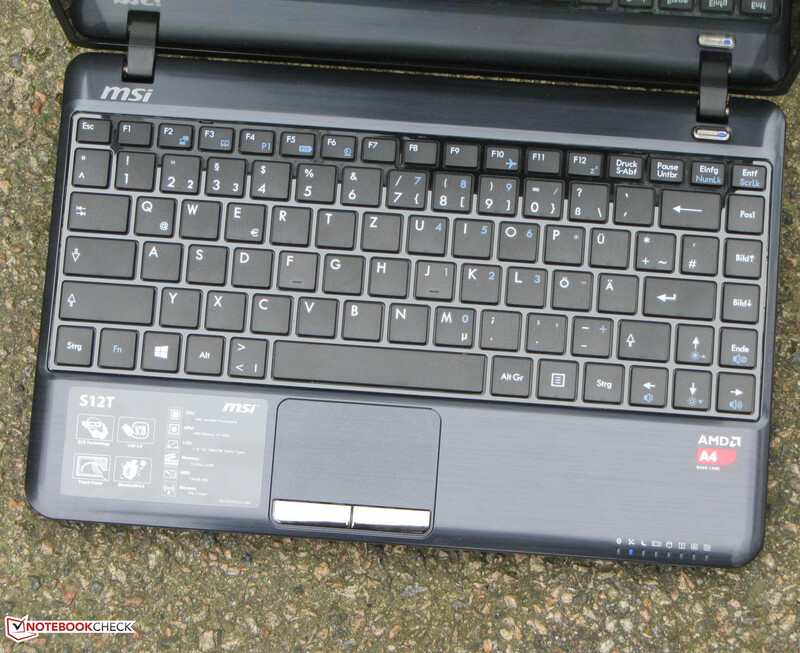 MSI's little laptop is equipped with an unlit chiclet keyboard. The keys feature a roughened, lightly concave surface. The drop is medium and the pressure point is clear. The keyboard yields very marginally when typing on it, but it is not interfering. The multi-touchpad in the S12T has a size of approximately 6.5 x 4.1 cm. The brushed texture is continued on the pad, and thus its surface is rough so it does not have an adverse effect. Gestures can be used quite easily despite the pad's small surface. Both mouse keys have a short drop and clear pressure point. MSI equips the S12T with a glare-type, 11.6-inch screen that has a resolution of 1366x768 pixels. The screen only achieves a brightness of 175.9 cd/m², which is not a good rate. We expect rates of beyond 200 cd/m² here, particularly in a 500 Euros (~$637) device. However, the contrast of 569:1 and black level of 0.32 cd/m² are very satisfactory. The screen's color reproduction is only standard. An average DeltaE 2000 shift of 9.48 is on the normal level for this price range. The target range of DeltaE less than 3 is very remote. The screen also has an evident bluish cast. The screen's reflective surface and its low brightness do not really allow outdoor use. 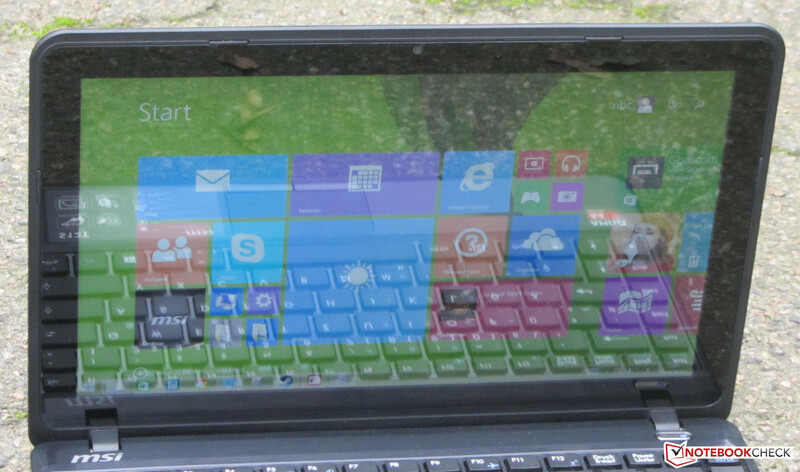 Its very limited viewing angles also correspond to the laptop's price level. MSI only installs a TN screen. MSI offers an 11.6-inch subnotebook/netbook with the S12T. The laptop is suitable for office, Internet, and video playback applications. Our review sample costs about 500 Euros (~$637), and other configurations are available. MSI opted for an A4-5000 APU (Kabini) from AMD for its S12T. The APU has four CPU cores that clock with a maximum speed of 1.5 GHz. It does not have Turbo. The TDP is 15 watts, which is on par with Intel's Haswell ULV processors. The processor's full computing performance is available in both AC and battery modes. It always performed the CPU tests of the Cinebench benchmarks with 1.5 GHz. The system runs smoothly owing to the solid state drive, and we did not experience any problems. The PCMark benchmark scores are very decent. The laptop can benefit slightly from the SSD. A solid state drive in the mSATA format is the storage device in the S12T. The SSD has a capacity of 128 GB. The recovery partition uses approximately 20 GB of that. The SSD achieves good transfer rates in total, but it cannot compete with the swiftest SSD models, such as the Samsung 840 EVO and - with restrictions - the Crucial M500. It is possible to additionally install a conventional 2.5-inch hard drive into the laptop should the storage be depleted. MSI includes the needed frame. The graphics core used in the S12T is called Radeon HD 8330. The GPU supports DirectX 11.1 and clocks with up to 500 MHz. The graphics chip is located in the lower field of the performance chart. Nevertheless, the core easily outperforms Intel's Bay Trail GPUs, like as found in the Aspire V3-111P. It is quite possible to use MSI's little laptop for gaming. However, users should limit themselves to games from the Windows Store. Apart from a few exceptions, modern 3D games virtually do not achieve any playable frame rates on the laptop. The laptop is already very audible in idle mode. The fan produces a permanent noise, and it speeds up considerably as soon as the laptop is loaded. We measured a consistent noise level of 44 dB(A) during the stress test. The rates are overall disappointing because the ThinkPad Edge also with the A4-5000 APU operates quieter over the entire load range. The Aspire does not have a fan and is consequently even quieter than its contenders. Only its hard drive noise is heard. 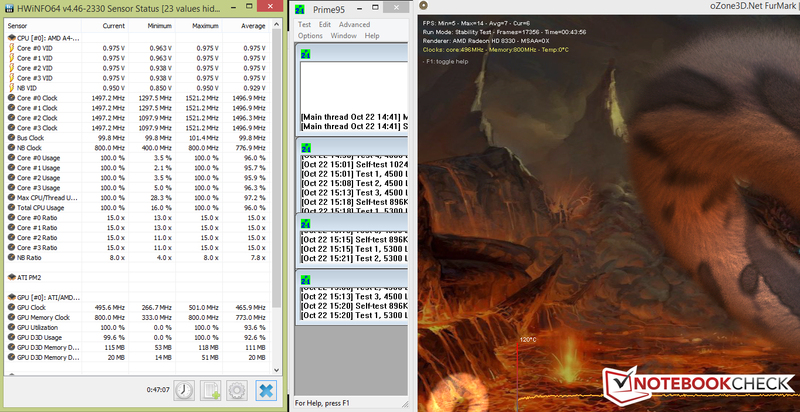 The CPU performed the stress test (Prime95 and Furmark run for at least one hour) with 1.5 GHz in both AC and battery modes. The graphics core processed the stress test with 496 MHz in AC mode. The speed was throttled to 400 MHz in battery mode. The laptop did not have any heat issues. The temperatures remained below 40 °C at every measuring point even in the stress test. The same is true for the ThinkPad Edge. Only the Aspire surpasses this threshold on two points - after all, it does not have a fan. (+) The average temperature for the upper side under maximal load is 28.6 °C / 83 F, compared to the average of 30.7 °C / 87 F for the devices in the class Subnotebook. (+) The maximum temperature on the upper side is 31 °C / 88 F, compared to the average of 35.8 °C / 96 F, ranging from 22 to 57 °C for the class Subnotebook. (+) In idle usage, the average temperature for the upper side is 30.3 °C / 87 F, compared to the device average of 30.7 °C / 87 F.
(±) The average temperature of the palmrest area of similar devices was 28.6 °C / 83.5 F (-2 °C / -3.6 F). The stereo speakers are on the underside of the front edge in the S12T. They can only offer a thin sound that lacks richness and bass. Speech is well-intelligible. Headphones or external speakers should be used when watching a movie on the laptop. The power consumption of the S12T is not surprising and ranges on the same level as identically configured laptops such as the ThinkPad Edge. The Aspire is overall more energy efficient than its contenders. Websites are automatically opened every 40 seconds using the energy-saving profile and a screen brightness of approximately 150 cd/m² in the practical Wi-Fi test. The S12T achieved a runtime of 3:14 hours - an abysmal rate. Both the ThinkPad Edge (7:44 h) and the Aspire (8:21 h) last more than twice as long. A look at the battery capacities reveal why MSI's laptop is drained so much sooner (MSI: 25 Wh; Lenovo: 63 Wh; Acer: 49 Wh). MSI's S12T-3MA441 offers enough computing power for applications from the office and Internet fields. The system runs very swiftly owing to the SSD. Furthermore, the laptop barely heats up. However, it produces too much noise. More conservative fan settings would be more appropriate. The battery life is also anything but good. 11.6-inch laptops are by definition designed for mobility, and thus should provide a long battery life. Therefore, MSI's laptop is virtually only suitable for home use. The screen also deserves criticism. MSI has installed a very dark model. In a nutshell, the S12T cannot keep up with its contenders. The Aspire V3-111P is available for 380 Euros (~$484) and has a considerably better battery life. The ThinkPad Edge E145 features a matte screen, excellent keyboard, and long battery runtimes. 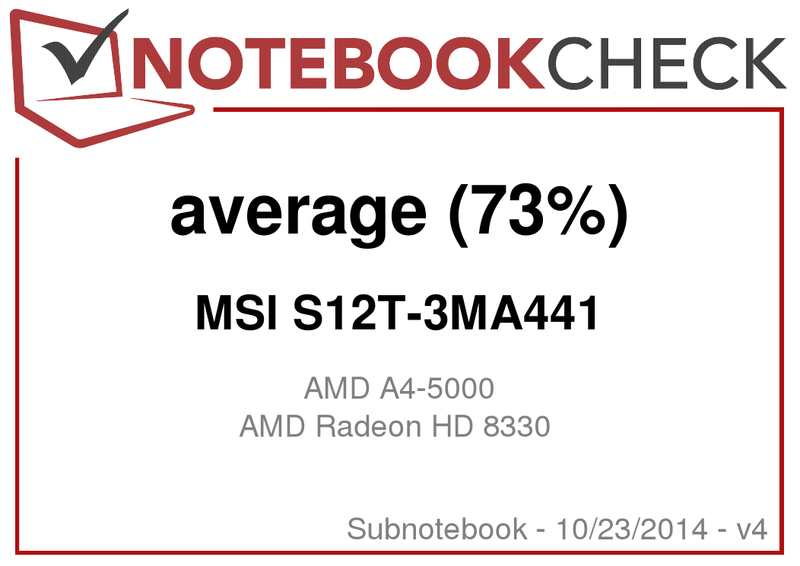 In review: MSI S12T-3MA441. Test model courtesy of Notebooksbilliger.de. The mSATA solid state drive and the empty hard-drive slot. A brighter screen and a better battery life. Lenovo ThinkPad Edge E145, Acer Aspire V3-111P, HP Pavilion 11-n070eg x360, Asus Transformer Book T200TA, Acer Aspire E3-111-C6LG, Acer Aspire V5-132P, Asus F200MA-CT067H.